Unfortunately, the human body cannot synthesize vitamin C, which is why it is an essential nutrient (4). So, you must consume high vitamin C foods to provide your body with the daily required dose of the vitamin, which is 75 mg for women and 90 mg for men per day (5). The best part is you don’t have to just depend on citrus fruits to get your daily dose of vitamin C, there are other foods that are equally rich in this vitamin. Read on to find out what those foods with vitamin C are. But first, let me tell you a few facts about vitamin C.
How To Consume Vitamin C? What Are The Benefits Of Vitamin C Rich Foods? Vitamin C, a water-soluble vitamin, is a small carbohydrate molecule, first identified by Albert von Szent Györgyi in 1920. He found that it was able to cure scurvy, a life-threatening condition caused due to a long duration of nonconsumption of fruits and vegetables. This scurvy curing molecule was named vitamin C, and the C stands for ascorbic acid as “ascorbic” means anti-scurvy. Vitamin C is naturally found in various foods and is an essential nutrient for both animals and plants (6). However, it cannot be synthesized by humans, primates, guinea pigs, birds, fish, and some bats. This is because one of the genes coding an enzyme (I-gluconolactone oxidase) required for vitamin C synthesis evolved into a nonfunctional gene.Therefore, humans need to depend on fruits and veggies for vitamin C and protect themselves from various diseases. Scurvy is no longer that prevalent. 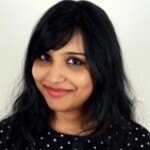 So, why is vitamin C consumption essential? Well, here’s your answer. Vitamin C or ascorbic acid is an electron donor. After donating an electron to a recipient molecule, it becomes ascorbate, which is an essential cofactor for various enzymatic reactions in the body (7). When there’s a deficiency of vitamin C, the lack of cofactor prevents the reactions from taking place, which ultimately leads to weak immunity, weak bones, infections, skin problems, poor wound healing, joint pain, depression, fatigue, inflammation, bleeding gums, scurvy, and anemia (8). So, it is clear that vitamin C is crucial to maintain a healthy body and strong immunity. Main Idea – Include vitamin C in your daily diet to prevent most diseases and lead a healthy life. Here are the 39 vitamin C-rich foods that you must include in your diet. Check out here some of the best foods with high vitamin C in detail. 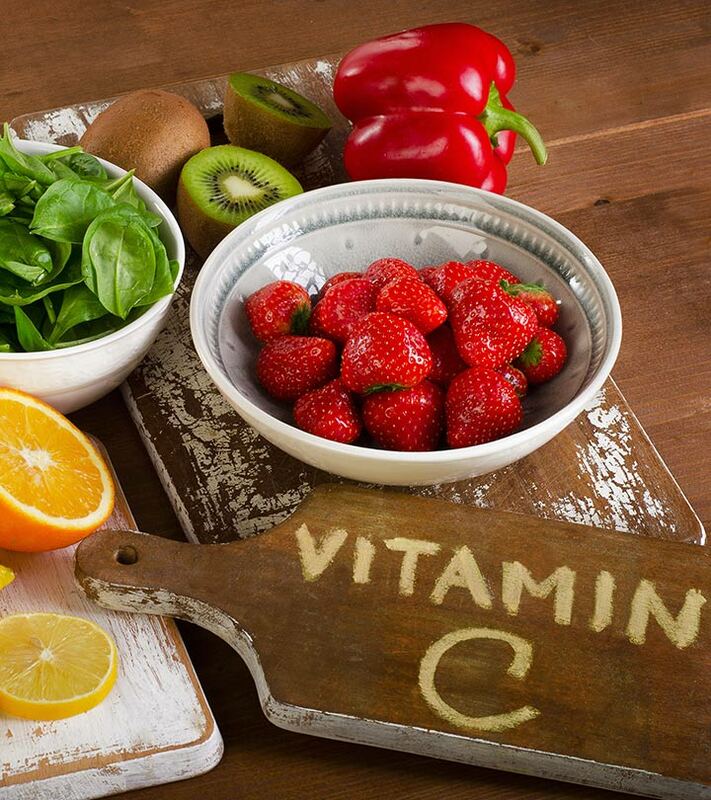 Here we list out what are the best vitamin c fruits and vegetables. Rose hip or rose haw is an accessory fruit of the rose plant that is mostly used to prepare jams, jellies, syrups, herbal teas, wines, marmalade, and rose hip soup. 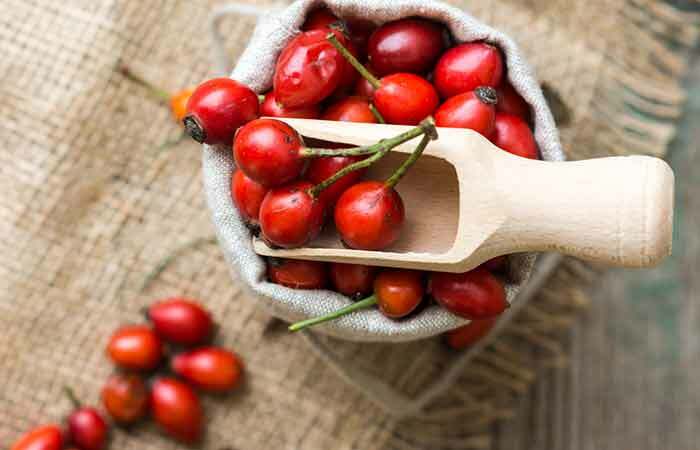 It is one of the top foods rich in vitamin C – 100 g serving of rose hips contains 426 mg of vitamin C (9). You can have rose hip tea or rose hip soup or prepare rose hip jam, jelly, or rose hip crackers. Or you can add them to your ice cream or cakes. Surprise! Green chilies is considered one of the best vitamin C food sources than limes, oranges, and lemons. Just 100 g of green chilis contains 242 mg of vitamin C, and 1 green chili contains 109 mg of vitamin C (10). That’s good news for those who love consuming it. You can add a little chopped green chili to your salad to give it a hint of spiciness. Add green chilis to curries or stews. You can also make pickle and have it as a condiment. Remember, if you cannot tolerate the heat of green chilis or suffer from IBS/IBD, stomach ulcer, or had a recent intestinal surgery, please avoid consuming anything spicy, and that includes green chilis. 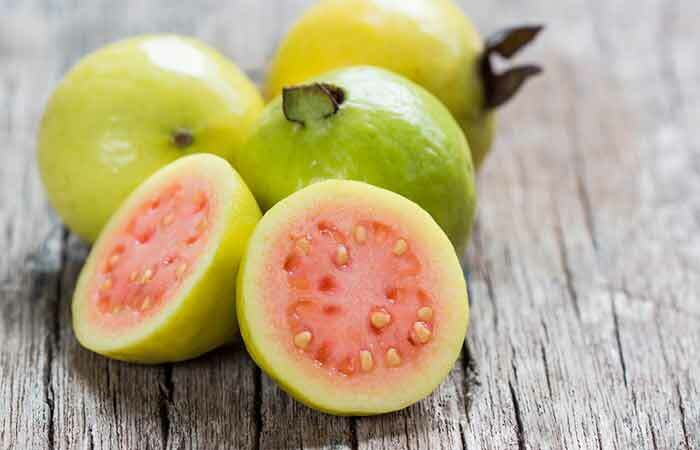 The ripe and aromatic guavas are one of the richest sources of vitamin C in the fruits category, with 100 g of the fruit containing 228.3 mg of vitamin C, or 1 guava containing about 126 mg vitamin C (11). Hence, if you consume one guava today, you do not have to worry about your vitamin C intake for the next day as well. Here are the various ways you can include it in your daily diet. Apart from consuming a guava as it is, you can add ripe guava slices to a salad made with cucumber, beetroot, carrot, and apples. You can also drink freshly pressed guava juice with a dash of lime juice and a pinch of pink Himalayan salt. You may also spread a teaspoon of guava jelly on your toast. Yellow bell pepper is considered one of the highest vegetables high in vitamin C – 183 mg of vitamin C in 100 g, and 1 large yellow bell pepper contains 341 mg vitamin C (12). You must consume this vegetable to boost your immunity and make your meals more colorful. Here’s how you can include in your daily diet. Add slices of yellow bell pepper to your salad, sandwich, wraps, etc. You can also add yellow bell pepper cubes to pasta or use it in Asian or Mexican cuisines. You can also stuff it with chopped mushrooms or chickpeas or any vegetable of your choice and bake it to make a super tasty and healthy meal. This humble herb contains highest amount of vitamin C, with 100 g of it containing 133 mg of vitamin C, and 1 tablespoon of it containing 5 mg of vitamin C (13). It not only adds flavor and taste to your food but also helps boost your immunity. 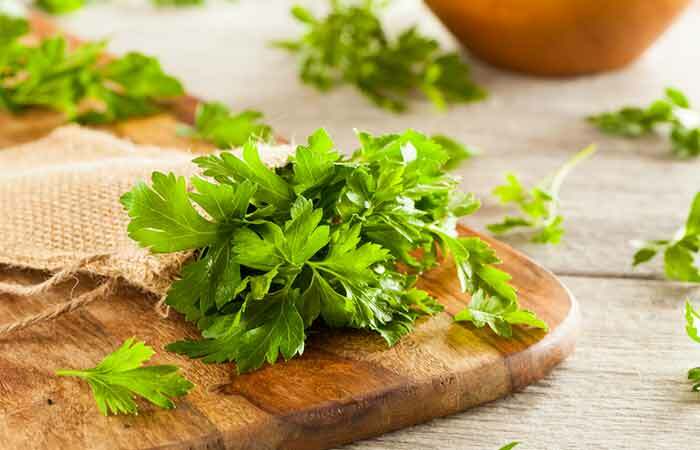 So, start including parsley in your daily diet from now on. Here are the various ways to do that. Add chopped parsley to savory tarts or quiches. Sprinkle chopped parsley on your salad or add it to your morning vegetable smoothie. Garnish vegetable or chicken stew with parsley or prepare a marinade with it to give meat or fish a distinct fresh flavor. They are scarlet, attractive, and rich in vitamin C. Did you know that a 100 g serving of red bell pepper contains 128 mg of vitamin C, or 1 medium bell pepper contains 152 mg of vitamin C (14)? What’s more, red bell peppers taste good and can make look any dish visually alluring. Here’s how you can include them in your daily diet. Add red bell pepper slices to your salad, wrap, or sandwich. You can also add red bell pepper to Asian or Mexican cuisines. It goes well with chicken or fish stews. Add it to your morning smoothie for an extra dose of vitamin C.
Kale is also known as leaf cabbage and is considered one of the most nutritious leafy greens. 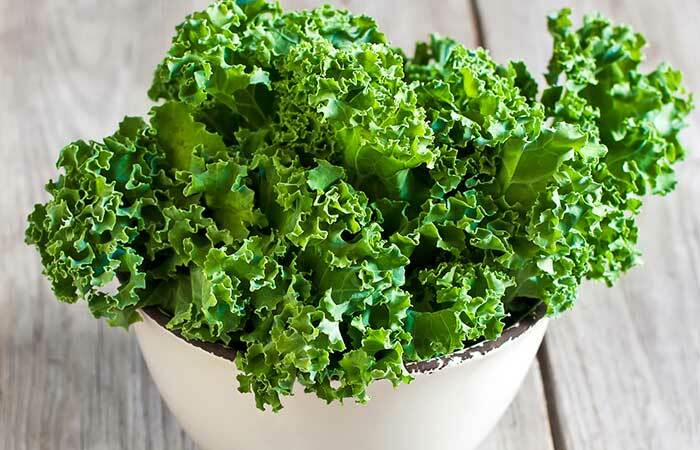 It contains 120 mg of vitamin C in 100 g, and 80.4 mg of the vitamin in a cup of chopped kale (15). This is considerably higher than a cup of chopped spinach, which provides only 8.4 mg vitamin C.
You can consume kale by adding it to your morning smoothie, salad, or stews. You can also make kale wraps with mushrooms or prawns along with other veggies. Another way is to add kale instead of lettuce in your burger or add kale as a topping on your pizza to make it a healthy option. Kiwi or Chinese gooseberry is a delicious tropical fruit and is loaded with vitamin C – 100 g kiwi contains 92.7 mg vitamin C, or 1 medium kiwi contains 70.5 mg vitamin C (16). It has a sweet and sour taste and a smooth texture. Kiwi is also a great source of vitamin A, dietary fiber, calcium, magnesium, and potassium. Here’s how you can include it in your daily diet. Add kiwi to your morning smoothie or juice it. Have it for breakfast or as an evening snack. You can also make detox drinks with kiwi, cucumber, and mint. If you are on a weight loss diet or in a cleansing mode, add kiwis to a bowl of other fruits and have it for lunch. 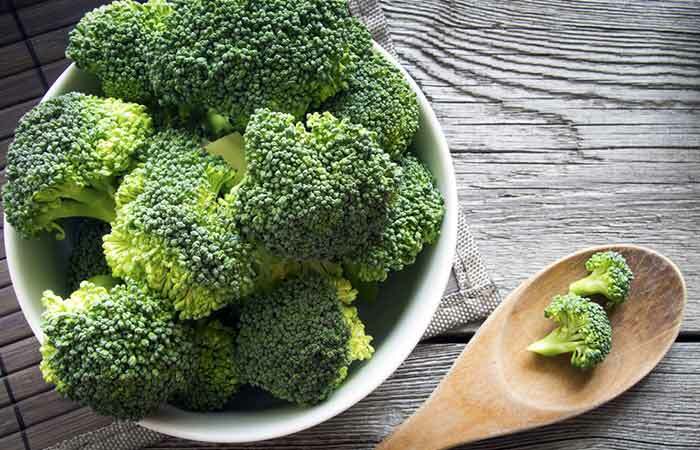 You will find broccoli on almost every healthy vegetable list. And this list is no exception! That’s because 100 g of this highly nutritious cruciferous vegetable contains 89.2 mg of vitamin C (17). There are various ways you can include broccoli in your diet. Here are a few of them. You can prepare a super healthy broccoli smoothie in the morning for breakfast or sauté it with other veggies. Or bake it and have it with baked sweet potato/fish/chicken breast. You can also make broccoli casserole or make wheat pasta with broccoli. These small green veggies are not only rich in dietary fiber and protein but are also a great source of vitamin C, with 100 g of raw Brussels sprouts containing 85 mg vitamin C, and 1 cup containing 74.8 mg. They are also rich in vitamin A, vitamin K, folate, potassium, calcium, and magnesium (18). You can prepare Brussels sprouts casserole. Bake or roast them or add them to your breakfast bowl containing bacon and avocado. You can also add them to soup or healthy homemade pizza. 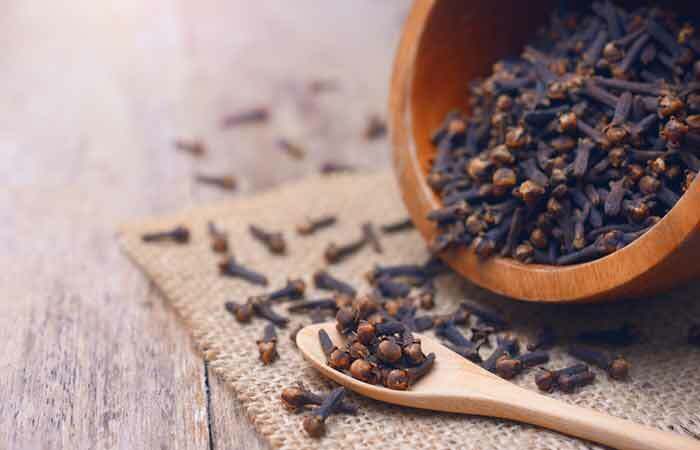 Clove is mainly used as a spice in Indian, Pakistani, Bangladeshi, Sri Lankan, Tanzanian, and Malagasy cuisines. It adds taste and life to many dishes. It has anti-inflammatory, antiviral, and antiseptic properties and is good for treating wisdom toothache. Cloves are also loaded with vitamin C – 100 g of clove contains 80.8 mg of vitamin C, and 1 teaspoon of clove powder contains 1.6 mg of vitamin C (19). Not sure how to include it in your daily diet? Here’s how. Spice up your curries with cloves or add aroma to your plain bowl of rice by adding one or two cloves. You can also directly chew a whole bud, which will act as a mouth freshener. Or add half a teaspoon of clove powder to your morning juice or smoothie. Lambsquarters, also known as goosefoot and bacon weed, can grow anywhere from the wild to the pot in your garden. It is a rich source of vitamin C, with 100 g containing 80 mg of vitamin C (20). You can buy this super healthy leafy veggie from the farmer’s market or a nearby supermarket. Here’s how you can use it. Bake an egg for breakfast with lambsquarters. Add them to your breakfast smoothie or evening juice, or make a delicious salad with apples, beetroot, lambsquarters, tomato, and olive oil. You may sauté it with other veggies and toss in a few cubes of poached chicken breast. One of the highest vitamin C fruits in this list. 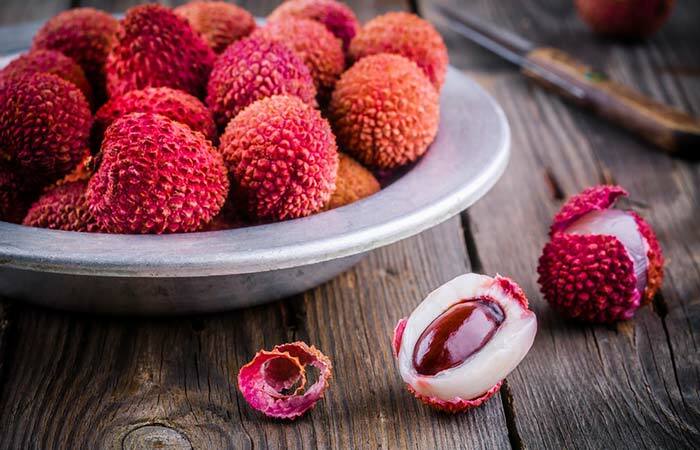 Sweet and succulent lychees are not only delicious, they are super healthy too. One lychee contains 6.8 mg vitamin C, and 100 g of lychees contains 71.5 mg vitamin C. They are also rich in potassium and healthy fats (21). Here’s how you can include them in your daily diet. You can have lychee fruit or make juice. You may also add it to your morning smoothie or add chopped lychee to your detox drinks, fruit salad, or even cakes. Mustard greens contain a good amount of vitamin C – 100 g mustard greens contains 70 mg vitamin C, and 1 cup of chopped mustard greens contains 39.2 mg vitamin C. They are also rich in dietary fiber, vitamin A, vitamin K, calcium, magnesium, and potassium and have no cholesterol (22). There are various ways to include mustard greens in your daily diet to improve your overall health. Here’s how. You can sauté them or add to vegetable/chicken broth, chickpea salad, cheese dip, or pasta. Kohlrabi or German turnip is a vegetable that you can eat raw or cooked. 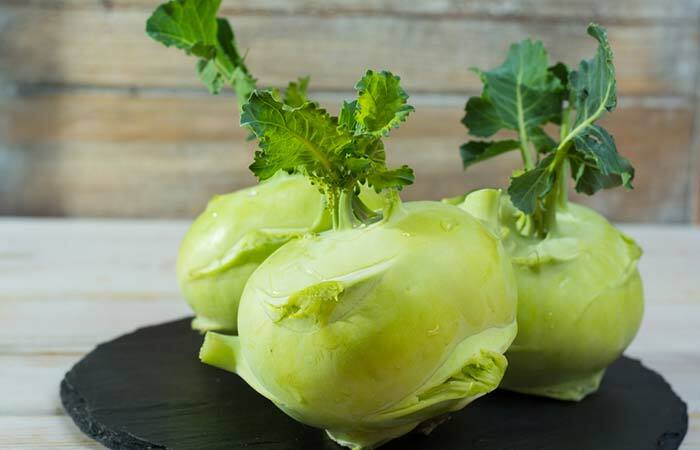 It tastes similar to broccoli, cabbage, and Brussels sprouts and is loaded with dietary fiber and vitamin C. One cup kohlrabi contains 83.7 mg vitamin C, and 100 g kohlrabi contains 62 mg of the vitamin. It is also rich in vitamin A, phosphorus, and calcium (23). You can add it to slaws, salads, soups, or stews, roast it, or make fritters or chips. Raw papayas are also a great source of vitamin C – 100 g contains 61.8 mg of the vitamin, and 1 small papaya contains 93.9 mg vitamin C. They are also rich in vitamin A, folate, dietary fiber, calcium, potassium, and omega-3 fatty acids (24). Here’s how you can consume raw papaya to get your daily dose of vitamin C.
You can make Thai papaya salad or sweet papaya chutney. You can also add raw papaya to chicken or vegetable stew or make sweet and sour papaya condiment. Strawberries need no introduction – they are a hit with almost everyone. 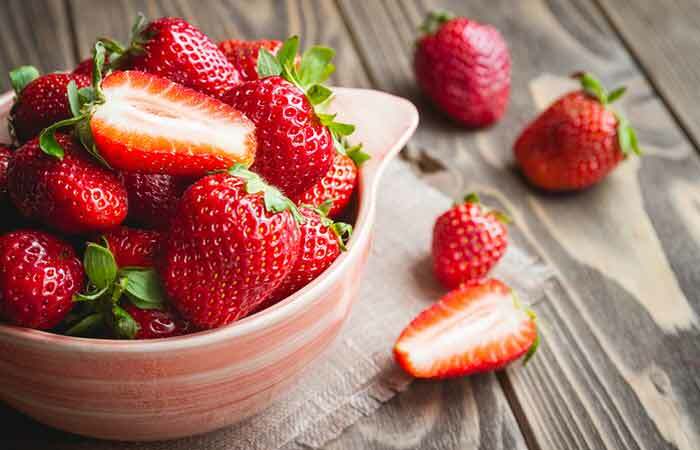 And now, you have got one more reason to include strawberries in your diet – 100 g strawberries contain 58.8 mg, and 1 large strawberry contains 10.6 mg of vitamin C. They are also a good source of protein and dietary fiber (25). You can eat the fruit as it is or add it to your breakfast bowl, breakfast smoothie, dip in chocolate, decorate your cakes and cupcakes, or make jam and jelly. Oranges are one of the most popular citrus fruits with vitamin C content in higher amounts – 100 g oranges contains 53.2 mg vitamin C, and 1 large orange contains 97.9 mg of it (26). Here’s how you can include oranges in your daily diet. You can eat the fruit as it is or make its juice. You can also add orange juice to cakes or make jam, jelly, syrup, etc. Add orange slices to salads or wraps to give them an extra dose of flavor and vitamin C.
Lemons and limes are both citrus fruits and hence have good vitamin C content – 100 g lemon contains 53 mg vitamin C, and 100 g lime contains 29.1 mg vitamin C (27), (28). They are also low in calories. Here’s how you can consume them. Mix the juice of one-fourth lemon or half a lime with two cups of water and consume it in the morning to flush out toxins. Add lemon or lime juice to your morning vegetable or fruit smoothie. 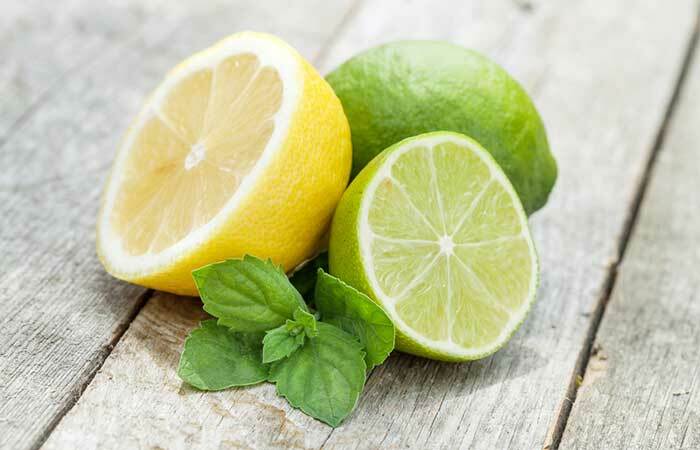 You can also make a homemade electrolyte using lemon/lime. Make a salad dressing or lemonade, and add lemon zest to cakes, or make lemon squares. Clementine is a hybrid between a sweet orange and a Mandarin orange. It is juicy and pulpy and loaded with vitamin C – 100 g of it contains 48.8 mg vitamin C, and 1 clementine contains 19.5 mg vitamin C. They are also a good source of vitamin A, calcium, potassium, phosphorus, and dietary fiber (29). Eat a whole fruit as a snack or drink its juice. You can also add clementine juice to your morning vegetable smoothie. Add clementine juice to cakes, cupcakes, stews, tarts, and chocolate fondue. Add clementine to salads or simply make clementine salad. Pineapple is a tropical fruit that tastes sweet and is bright yellow when ripe. 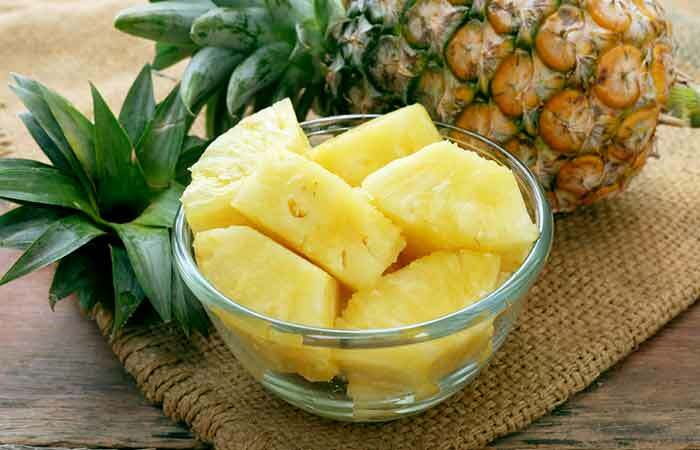 One cup of pineapple contains 78.9 mg vitamin C, and 100 g of it contains 47.8 mg of the vitamin. It is also a good source of vitamin A, calcium, potassium, and dietary fiber (30). Here’s how you can include it in your daily diet. Cut the fruit into small cubes and add a dash of lime and a pinch of pink Himalayan salt to enjoy a citrusy pineapple salad. You can add pineapple juice to stews or to marinate meat. Add pineapple chunks to pizza to make Hawaiian pizza. Cauliflower is a cruciferous veggie, and 100 g cauliflower contains 46.4 mg vitamin C. It is also rich in protein, calcium, vitamin K, potassium, and phosphorus (31). Here’s how you can include cauliflower in your daily diet. You can sauté, roast, and grill cauliflower. You can also add it to vegetable or fish stew or make cauliflower casserole. Chinese cabbage or pak choi is a leafy vegetable that tastes somewhat like lettuce and looks more like a cabbage. 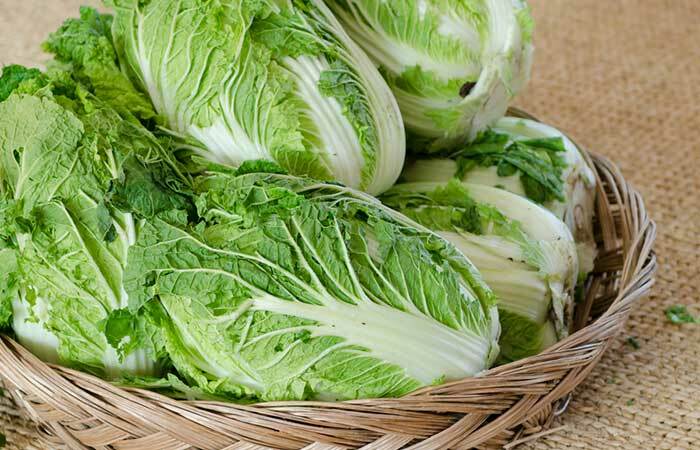 And 100 g Chinese cabbage contains 45 mg vitamin C, and one cup of it contains 31.5 mg and only 9 calories. It is also a good source of protein, vitamin A, vitamin K, calcium, phosphorus, and potassium (32). If you are not sure how to consume it, scroll down. You can consume Chinese cabbage in salads, slaws, soups, or sandwiches. Or you can make Chinese cabbage wraps and pickle. Watercress is nutritious aquatic plant and is the oldest known leafy vegetable. There are numerous health benefits of consuming watercress, and it is rich in vitamin C, with 100 g watercress containing 43 mg vitamin C, and 1 cup chopped watercress containing 14.6 mg. It is also loaded with vitamin A, vitamin K, calcium, and potassium and has zero cholesterol (33). Here’s how you can include it in your diet. You can prepare a smoothie or toss a few sprigs into the salad, make soup, use it as a garnish, or prepare a dip. 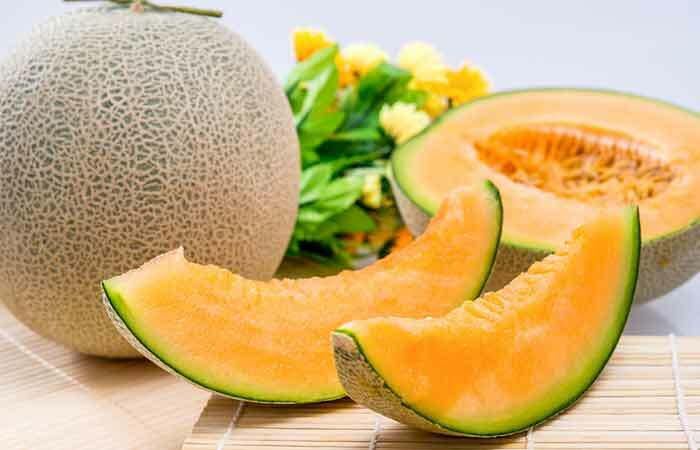 Cantaloupes are loaded with vitamins, minerals, and dietary fiber. They are anti-inflammatory and help to rehydrate the cells. Cantaloupes are also rich in vitamin C as 100 g contains 36.7 mg vitamin C, and an ounce of this fruit contains 10.3 vitamin C. It also contains a good amount of vitamin A and potassium (34). Here’s how you can consume it. Eat the fruit as it is (do not forget to peel it). Blend it into a smoothie and have it for breakfast. You can also toss it in a bowl with other fruits and add lime juice and a pinch of black pepper and salt. Cabbages are loaded with nutrition and are rich in vitamin C – 100 g of cabbage contains 36.6 mg of vitamin C, half of the total recommended value for humans. Cabbages also help to fight off cancer and heart diseases. Red cabbage provides a significant amount of nutrients, with 100 g of the veggie containing 57 mg of vitamin C, along with vitamin A and fiber, and just 31 calories (35),(36). Here’s how you can include it in your daily diet. You can add cabbage to your salad, soups, and stews. Make cabbage curry, or add chopped cabbage to fried rice. Collard greens look similar to spinach and are highly nutritious leafy green vegetables with vitamin C in high amounts. An ounce of collard greens contains 9.9 mg vitamin C, and 100 g contains 35.3 mg of the vitamin. They are also a good source of vitamin A, vitamin K, dietary fiber, calcium, and potassium (37). Here’s how you can consume them. You can blanch collard greens and add it to your salad. 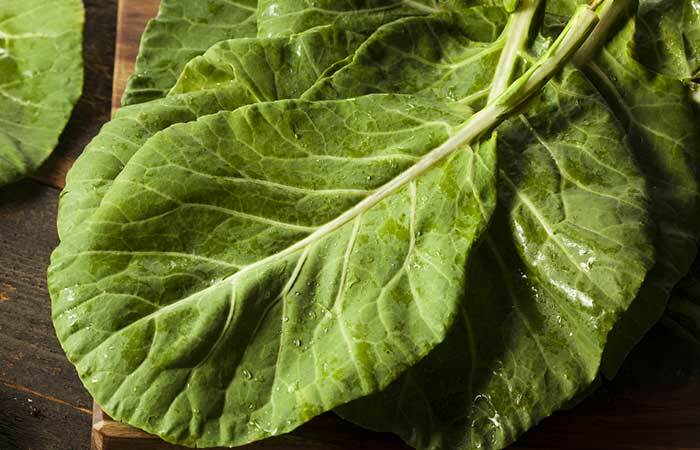 Add collard greens to mushroom or chicken soup/stew or make collard green wraps. You can also cook collard greens with white beans, pasta, shrimp, and tofu. It is a well-known fact that grapefruit aids weight loss. But did you know that this tangy fruit can also help improve your immunity? That’s because 100 g grapefruit contains 31.2 mg vitamin C, and half a fruit contains 38.4 mg vitamin C. They are also rich in vitamin A, calcium, potassium, phosphorus, and dietary fiber (38). Here’s how you can consume grapefruit. Have half a grapefruit for breakfast. Drink freshly pressed grapefruit juice or add it to stews or marinate meat in it. You can also prepare grapefruit salad or toss a few grapefruit slices into tuna salad or grilled chicken salad. 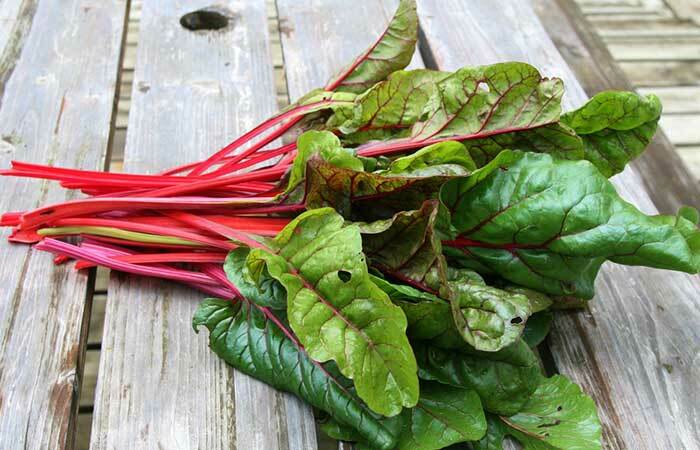 Swiss chard has red stems and dark green leaves. These are highly nutritious and must be included in your daily diet. One Swiss chard leaf contains 14.4 mg, and 100 g contains 30 mg vitamin C. It is also a rich source of vitamin A, vitamin K, calcium, magnesium, potassium, and dietary fiber and has no cholesterol (39). Here’s how you can consume it. You can blanch or sauté Swiss chard and make a salad. You can also toss it into a pot of stew or soup. Prepare cheese and Swiss chard sandwich or shrimp wraps. You may also add it to your quiche to make it super healthy. Spinach can make you stronger – Popeye taught us this, and it’s true! It is not only a great source of protein, vitamin A, dietary fiber, calcium, potassium, and magnesium, but it also contains a good amount of vitamin C – 100 g spinach contains 28.1 mg vitamin C, and a bunch of spinach contains 95.5 mg. Here’s how you can include it in your daily diet (40). You can blanch or sauté spinach and have it with other veggies or chicken/fish/mushroom/eggs/tofu. You can also make spinach smoothie or toss it into your chicken clear soup or broth to make it extra healthy. You can also include it in egg frittatas and quiches. Gooseberries are mostly found in India, Bangladesh, Sri Lanka, Africa, and European countries. They are light green and taste sour. 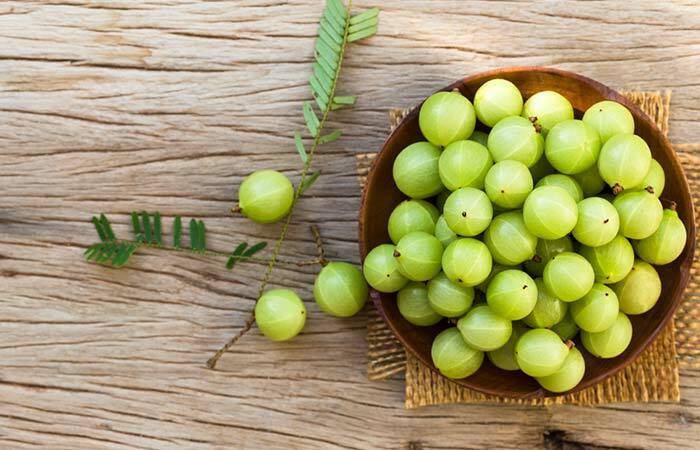 According to Ayurveda, gooseberries have numerous health benefits. And some of the health benefits are due to their vitamin C content – 100 g gooseberry contains 27.7 mg vitamin C. It is also rich in vitamin A, potassium, omega-3 fatty acids, and dietary fiber (41). Here are the ways you can include it in your diet. Eat the fruit as it is. You can also sun-dry it first and then consume 2-3 slices every day. Drink gooseberry juice or add it to your morning smoothie. You can also prepare gooseberry pickle. Mangoes are super delicious, but many of us avoid them as they are a little on the higher calorie side. But what we forget is that they are rich in dietary fiber, minerals, and, of course, vitamin C. One mango contains 57.3 mg vitamin C, and 100 g contains 27.2 mg of the vitamin (42). Hence, consuming one mango every alternate day can prove to be highly beneficial for your health. Consume the fruit as it is or make juice, smoothies, and shakes. You can also add it to your ice cream or eat it with a cup of yogurt. Decorate your cake with mango slices or add mango to your fruit salad. 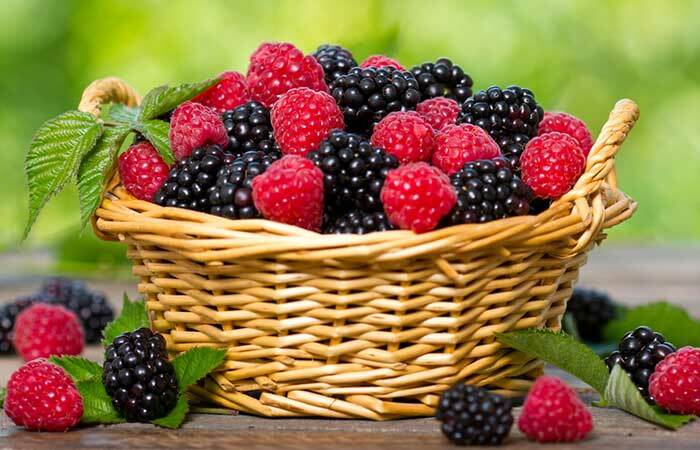 Raspberries and blackberries are powerhouses of nutrition. They contain healthy compounds like folate, fiber, and additional antioxidants that works with vitamin C to have health promoting effects. Well, 100 g raspberry contains 26.2 mg vitamin C, and 100 g blackberry contains 21 mg vitamin C (43),(44). They help improve memory and protect our body against cancer and heart diseases. Raspberry and blackberry make an ideal snack with their tangy taste and high nutrient value. They are delicious and make a great addition to desserts. And the antioxidants in these berries help to reduce oxidative stress and control cholesterol. Eat the fruits as it is. Make yogurt-filled raspberries. Add blackberries to cakes or make jam. Or you can simply add these berries to your breakfast bowl or morning smoothie. Potatoes are easy to store, inexpensive, and easy to cook. Around 19.7 mg of vitamin C is present in 100 g of raw potato (45). Here’s how to include potatoes in your diet. Consume baked or boiled potato, preferably with the skin, to get the maximum amount of vitamin C.
Fresh green peas are a good source of plant-based proteins, and 100 g contains 14.2 mg vitamin C (46). 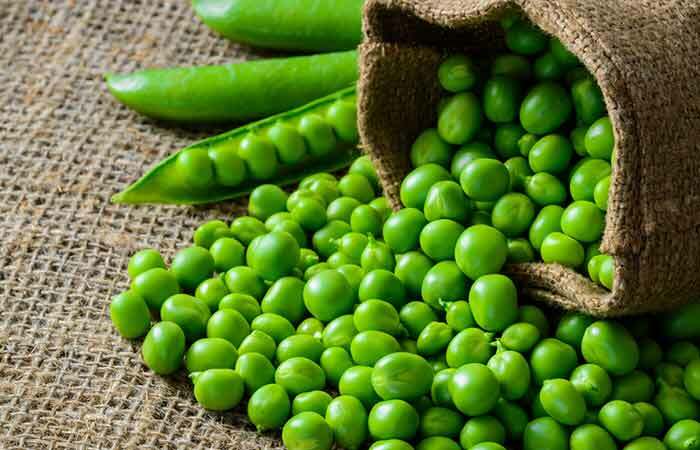 An excellent source of iron, vitamin C, and other nutrients, peas help to reduce the risk of developing cancer, depression, high cholesterol, and macular degeneration. You can add peas to stews, mashed potato, curries, soups, salads, and quinoa. Bright red and cute-looking tomatoes are also a common source of vitamin C in addition to other antioxidants such as lycopene. Sun-dried tomatoes are particularly high in this nutrient – 100 g tomatoes contains 12.7 mg vitamin C, and 100 g sun-dried tomatoes contains 39.2 mg vitamin C (47),(48). Here’s how you can include them in your daily diet. Tomatoes can be added to sandwiches and salads apart from their typical use in curries and food preparations. You can also have tomato juice in the morning or post workout to see miraculous weight loss and skin benefits. The earthy-rooted, smoky-flavored, and pretty looking turnip is surprisingly full of vitamin C and essential amino acids. 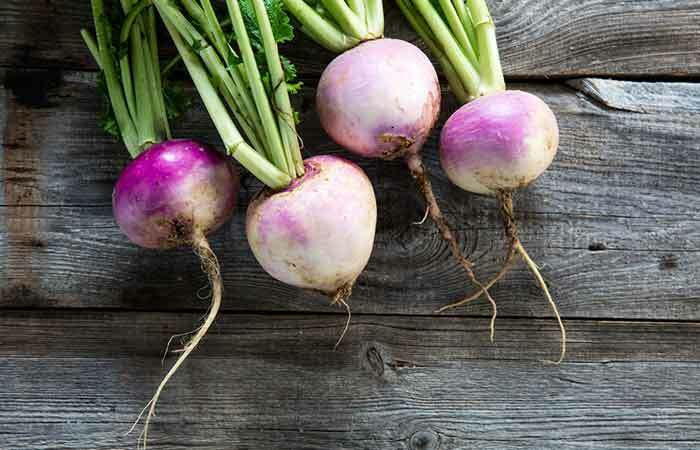 It is rich in calcium, phosphorus, and potassium, and 100 g turnips contains 11.6 mg vitamin C (49). It also contains complex carbohydrates and dietary fiber, which adds to its healing power. Here’s how you can consume it. You can add turnips to stews, soup, pasta, salads, and casserole. Apricots are great for your skin, and that’s because they are loaded with dietary fiber, vitamin A, potassium, protein, and vitamin C, which aids collagen synthesis. What’s more, 100 g apricot contains 10 mg vitamin C and has only 48 calories (50). Let me tell you how you can include apricots in your daily diet. You can eat the fruit as it is or have dried apricots. Add chopped apricots to juices, smoothies, salads, and desserts. These sweet and tangy fruits are mouthwateringly delicious. 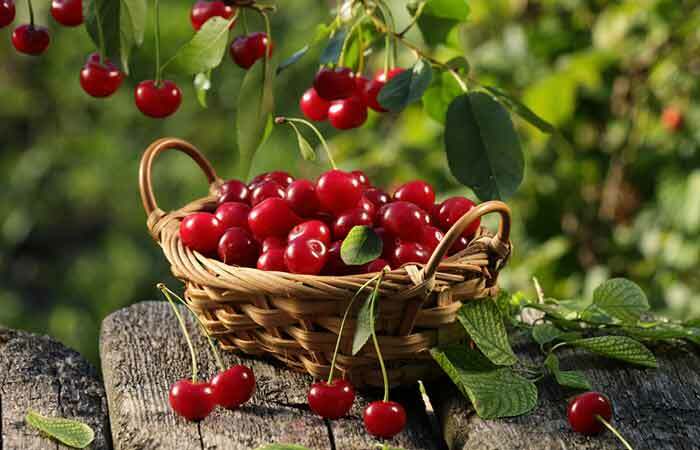 Moreover, they are one of the better vitamin C sources – 100 g cherry contains 7 mg vitamin C. They are also rich in vitamin A, folate, calcium, protein, and potassium (51). Here’s how you can include cherries in your daily diet. Consume the fruit as it is or make caramel cherries. Add chopped cherries to fruit salad or decorate your cake with cherries. You can also add dried cherries to homemade cakes or fruit smoothies. So, these were the 39 good sources of vitamin C that you must include in your diet. 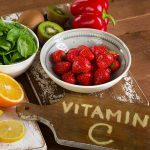 Now, take a look at the next section where I will explain the best way to consume vitamin C.
This vitamin is a highly sensitive nutrient that reacts to air, water, and heat. It is best to consume rich vitamin C foods in their raw form or steam them. Boiling may reduce the quality of vitamin C by up to 33%. Thawing and freezing vegetables over a long period also lead to loss of vitamin C.
Cooking vegetables for 20 to 30 minutes at a stretch can result in the loss of nearly half the nutrients. If you boil the veggies, most of the nutrients are lost in water. So, consume the liquid in which you cook the veggies. Reheating and canning decrease vitamin C content by two-thirds. So, that was all about the top vitamin c foods & how to consume it effectively. And now, for a few facts and myths about this vitamins. VItamin C has many other health benefits as mentioned at the beginning of this article. Many of us assume that it will help cure a cold and cough. But scientists believe they need more evidence to prove that. Vitamin C may boost the immune system and reduce the frequency of common cold, but it has not yet been proven that it helps to reduce or prevent common cold (52).(53). The next big question is how much vitamin C do you really need to keep all health problems at bay? Here’s a recommended dietary intake chart for vitamin C.
Here’s the recommended daily dose of vitamin C. However, you must consult your doctor to avoid megadosing and understand if you need additional vitamin C supplement for a few days or if consuming a certain source of vitamin C may irritate your GI tract. This table is for generic reference. Take a look. This recommended dietary intake of vitamin C was developed by Food and Nutrition Board at the Institute of Medicine of the National Academies (54). When you start consuming vitamin C regularly, you will reap the following health benefits. Help strengthen the bones and prevent osteoporosis (57),(58). Recent research shows that vitamin C protects from atherosclerosis, inhibits LDL cholesterol oxidation, and improves arterial stiffness and lipid profiles (59). Vitamin C also helps in healing wounds (60). Scientists have found that vitamin C can help lower blood pressure (61). Researchers also believe that vitamin C is essential for maintaining oral health and preventing tooth loss (62). Vitamin C is also beneficial for preventing neurodegenerative diseases (63). Vitamin C may also treat and prevent obesity by attacking the root causes of weight gain (64). Now you know all the main facts and important foods that are the best vitamin C foods and how to consume them. Try to get your daily dose of vitamin C, and you can see the difference in just a few days. You will start to feel better, your skin will start to glow, and you will become more proactive. So, start living a healthy life by consuming these foods high in vitamin C. Take care!